Summer isn’t all about dressing down, sometimes a suit should be worn. This summer suit, worn casually with trainers and relaxed detailing is a great summer look. River Island team up with Marcus Jaye from The Chic Geek to discuss what to wear at Valentines Day. Grey is a neutral colour every guy should own, but how about wearing a look consisting of all grey? The different tone in the shirt makes this look work, but what do you think? Topman Design is something a lot of fashion fans like, btu for the regular gent it may not be for them. This video shows how to wear Topman design in a quick look. 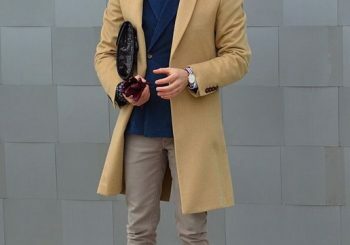 Camel and navy is a colour combination we’ve always been a fan of, and the beige jeans really draw attention to the combination nicely. A top look, mixing formal pieces with casual touches.